Trakdesk's IP whitelisting lets you add trusted networks and locations so you can limit access to your helpdesk. IP whitelisting can be configured to restrict access to your helpdesk especially if you do not want your agents to login to your helpdesk from outside of work. You can simply do this by adding the IP address or scope of addresses of your network. You can also apply this restriction to your customers as well, which can be used to prevent access to certain part of your support portal, such as tickets and knowledgebase articles. 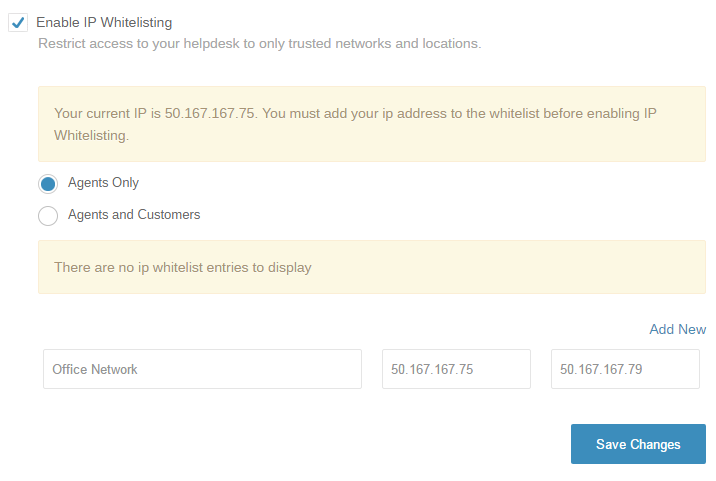 Select the Enable IP Whitelisting option and click on the Add New option to add a new whitelist entry. Choose whether if IP Whitelisting should apply to agents only or both agents and customers. Enter a brief description and your ip address or scope of addresses. Note: Your IP Address must be added to the list of trusted networks before enabling IP Whitelisting. Finally, click on the Save Changes button to apply your changes.